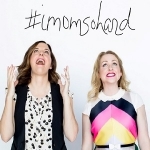 #IMOMSOHARD has grown to over 1.5 million follows across platforms and over 120 million video views. One of their most shared episodes, “I Swimsuit Season So Hard,” has over 20 million views! The moms tried on the summer’s hottest — and most ridiculous — swimwear. They’ve appeared on “The Today Show” and “The Doctors.” They were also selected for People Magazine’s best of 2017. Their plan for complete world “mom-ination” includes a half-hour comedy. They’re developing one now with CBS.